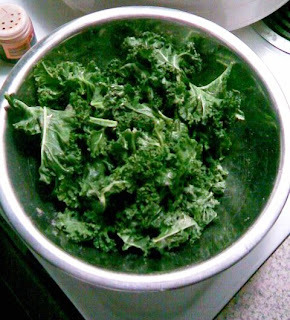 Kale chips are a favorite of raw newbies and veterans alike. They are nutritious, fairly quick and very easy to prepare. Collard greens are also excellent in chip form. You can purchase these from many stores that sell raw foods, but they are pricey. Whenever I get a good deal on greens, I grab a few extra bunches and then prepare them at home for a fraction of the cost. These can also be stored, but mine never make it that far. 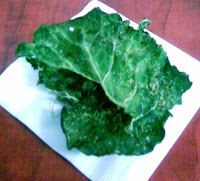 We enjoy them fresh from the dehydrator! Remove stems and break the greens up into chip size pieces. Toss in evoo and salt. 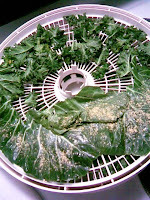 Dehydrate on 110 degrees until crispy (about 5 hours). You can use all kinds of combinations to flavor your greens. Here are some of my favorites. These are really fun to eat. I feel like I'm snacking on fall leaves!